Silvia Pan, an engineer at AMC Networks, often is the only woman in the room when she is at hackathons, intense coding events where teams collaborate on building apps or websites, often over the course of a sleepless weekend. Gender was not the only aspect that set Hack It Together apart. 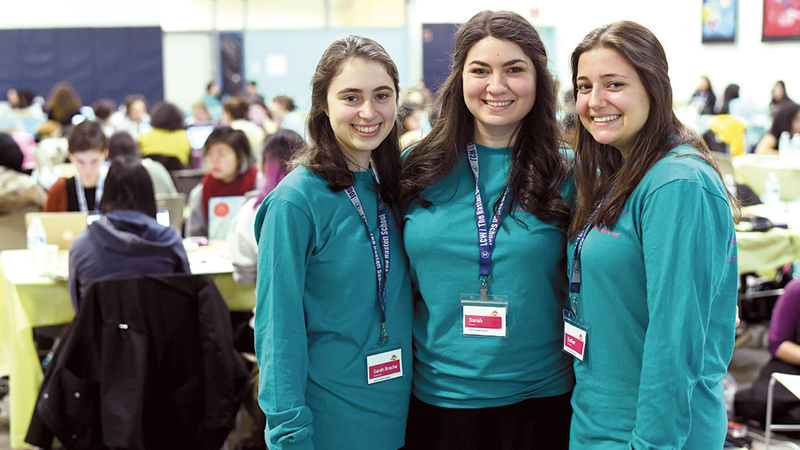 Because Lander is a division of the Orthodox-affiliated Touro College and University System, this Sunday hackathon offered participants an atmosphere that did not desecrate the Sabbath and where the meals and energy-boosting snacks were strictly kosher. “As a religious Jew, there aren’t so many of these types of events I can participate in because they always involve Shabbes,” Sarah Cohen of Wesley Hills said. “It ends up being super annoying because these events are a cornerstone of getting into the computer-science industry; it’s a great way to network and gain experience.” Ms. Cohen, a computer-science major and a senior at Lander, was among the organizers of this fourth annual Hack It Together. The all-female environment is intended not only to support female students already interested in coding but also to encourage more girls to try it, she added. Many high-tech companies are actively seeking qualified women to diversify their staff. There was certainly no bro culture — with its all male, high-testosterone affect — at Hack It Together. In addition to 35 Lander students, attendees came from nearly 40 universities and high schools, including Barnard, Princeton, University of Pennsylvania, and Bruriah High School for Girls in Elizabeth, as well as organizations such as Women Who Code and Girls Develop It. The overall assignment was to create a product that could solve a problem or address a need related to entertainment and travel. Hackers had to write all their own code but could consult professional coders who served as mentors throughout the day. Hack It Together sponsors AMC Networks and JetBlue Airways also offered company-sponsored challenges that participants could choose to do. The JetBlue challenge was won by students from the Flatiron School, an accelerated programming school in Manhattan for job-seekers. They created an interface for passengers to discover volunteer opportunities at their destination, tied to gaining bonus miles from the airline. Their prize was round-trip JetBlue tickets to any domestic destination. For the AMC challenge, one student group pitched a social viewing platform on which users could review shows in real time, write recommendations, and invite friends to watch with them. The students were invited to AMC headquarters in Kansas to present their idea to executives and explore internship opportunities at the company. Each team presented a three-minute demo of its app. Judging was based on factors such as innovation, usability, problem solving, and technical achievement. The first prize went to a project dubbed “Boundless,” created by a team of three Lander students and a Rutgers student, which allowed air passengers to select and explore locations to experience in virtual reality as they fly over them. While the college hosts the event, a student committee handles all logistics, including sponsorships. In addition to JetBlue and AMC, other corporate sponsors the committee signed up were Balsamiq, Grace Hopper Full Stack Academy, Motionden, Wolfram Language, and Lexmark. Kind and Herr’s contributed snacks. 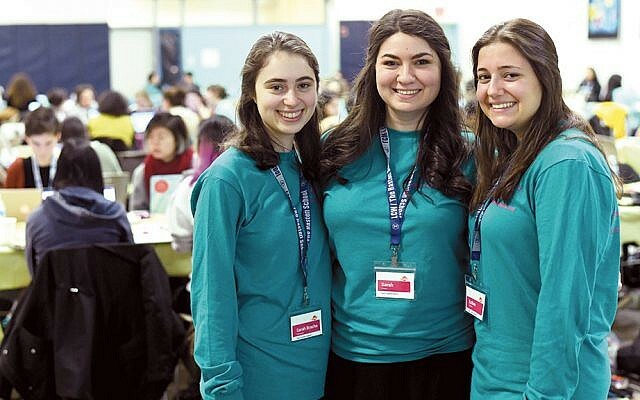 Ms. Cohen and her committee also arranged pre-hack workshops led by engineers from JPMorgan Chase and Amazon and a user experience designer at 1010Data — all women — and by Yosef van Bemmelen, a Teaneck native who co-founded Amazon Web Services consulting partner firm Elementryx. 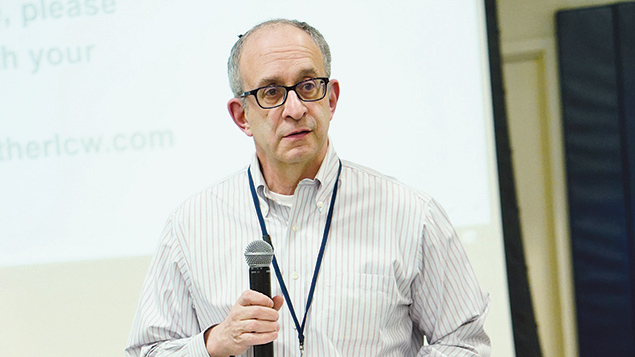 Dr. Alan Kadish of Teaneck, the president of Touro College, said this year’s hackathon was the largest ever. He added that Hacking It Together teams retain the intellectual property for their creations and may choose to develop their products further.